Texas A&M senior Jessica Roland established a new record when she picked up her 93rd doubles victory this past month. 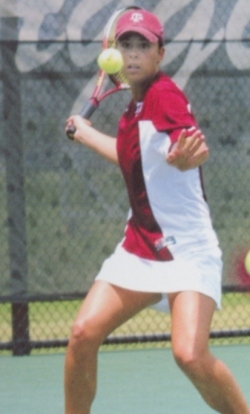 The previous record of 92 had been set by Nancy Dingwall through her 1994-97 college tennis career. Coach Steve Wilkinson of the Gustavus Adolphus reached a milestone with his 800th win. Over his 34 years at the school he achieved a record of 800-241. Coach Wilkinson is only the fourth coach in the history of collegiate tennis to post 800 wins. The April ITA National Team Sportsmanship Awards were given to the San Diego State women and the men of Washington & Lee and Oregon. The winners are selected each month by the ITA Ethics and Infractions Committee from nominations received from ITA member institutions. Three new USTA Professional Circuit events are now being played at the West Side Tennis Club in Forest Hills. The first of these events, The Forest Hills Tennis Classic, is a $50,000 Men's Clay Court Challenger which runs May 8-15th. Admission is free until the semis on the 14th. The next two events, the Forest Hills Grass Court Classic and the WTA Hard Court Tournament, will provide additional opportunities for college players to play with the pros. For more information, visit http://www.foresthillstennis.com. The Intercollegiate Tennis Association (ITA) is in need of donors to help fund its programs and activities. To this end, they have formed the College Tennis Foundation (CTF). The CTF is a non-profit entity that is looking for (tax deductible contributions). For more information, contact itaamy@aol.com. Information on incoming freshman, transfers and players who have left school to turn pro is now in our Status Report section.